Tailgates & Tanlines, released in 2011, includes “Country Girl (Shake It for Me),” and the number one singles “I Don’t Want This Night to End,” “Drunk on You,” and “Kiss Tomorrow Goodbye.” Bryan’s fourth album, Crash My Party, was released in August 2013 and includes the number one singles “Crash My Party,” “That’s My Kind of Night,” “Drink a Beer,” “Play It Again,” “Roller Coaster” and “I See You.” His fifth album, Kill the Lights, was released in August 2015 and its lead single, “Kick the Dust Up,” became his thirteenth number one hit, followed by his fourteenth number one “Strip It Down.” Bryan co-wrote all of his singles with the exception of “Drunk on You,” “Crash My Party,” “That’s My Kind of Night,” “Drink a Beer,” “Play It Again,” “Roller Coaster,” “Kick the Dust Up” and “Home Alone Tonight” and co-produced all four albums and one compilation album with Jeff Stevens. Bryan was the recipient of the Academy of Country Music Awards and Country Music Association Awards “Entertainer of the Year” award.To date, Bryan has sold over 7 million albums and 27 million singles worldwide. 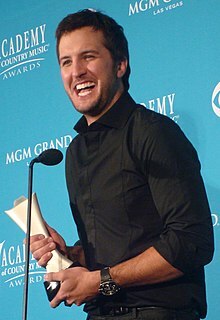 Instead, Luke went to college at in Statesboro, Georgia, where he joined the Sigma Chi fraternity and graduated in 1999 with a bachelor’s degree in business administration. One of Bryan’s Chapter Brothers is Cole Swindell, Georgia Southern 2005, who won the Academy of Country Music’s New Artist of the Year Award in 2015.